Lifeguards like ice cream too! 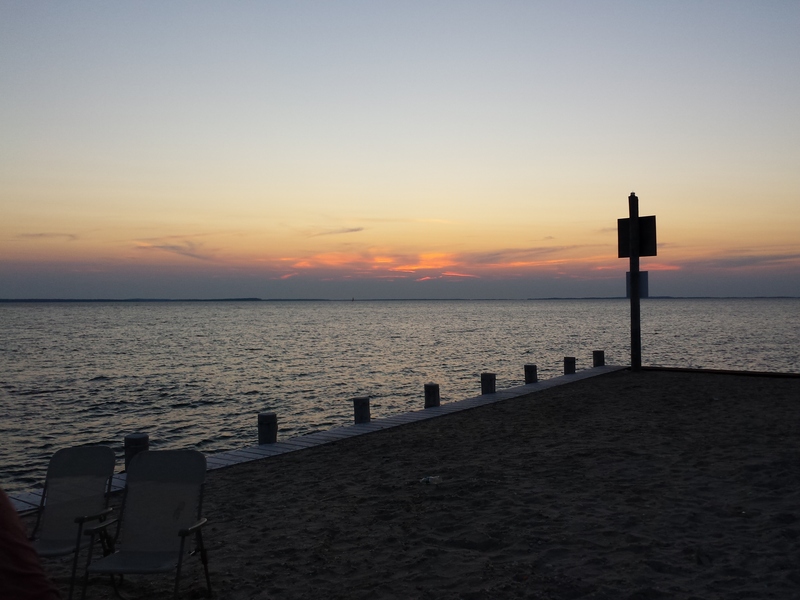 Usually, we tell you about our touristic activities on the North Fork of Long Island. Wineries, picnics, great shops, and photo ops are all grist for the Trip Around Town mill. This time, it’s a bit different. I’m going show you what the July 12, 2014 Clearwater Beach community BBQ was like. By the way, unlike most of our Trip Around Town posts, only Clearwater Beach residents and their guests can attend our BBQ. So, if you are not a resident or friend of one, come visit the community. Perhaps you will want to move here. We all love it! I look forward to meeting next year! We live in a small community called Clearwater Beach. Located at the north end of Springs, and surrounding Hog Creek, it is off the track for most Hampton’s visitors. Clearwater is a quiet, friendly place where I love to greet my neighbors as I jog or bicycle around each morning. 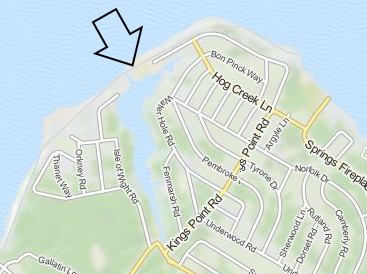 Clearwater residents enjoy a private beach (note the arrow, pointing right at the reservation) and BBQ area facing Gardiners Bay, and a private marina in Hog Creek. This recreational area is known as “the reservation”, as the original developers of the community “reserved” it for the communal use that it sees today. The annual community BBQ takes place at the reservation, on the second weekend of July. With 900 homes in Clearwater, families and friends make for a crowd. Here, mostly in pictures, is how the folks in Clearwater have some fun. This is a beach party, with friends and neighbors relaxing on the sand, and setting up tables, chairs, and umbrellas for the food-fest. During the Memorial Day to Labor Day period, Clearwater provides lifeguards to keep swimmers safe. Our beach on Gardiners Bay is clean and beautiful, just like the rest of the reservation. Party-goers would soon be busy eating picnic foods they have brought, and grilled burgers and hot dogs provided by the Clearwater Board of Directors. This is a good place to thank the board for the hard work they do every year to put on this party. When I was a director, I was surprised to see how much planning and permitting went into an afternoon’s fun. This year, the menu was straightforward. Burgers, dogs, and sides including baked beans, sour kraut, cole slaw, and other foods familiar to the BBQ devotee appeared. Not by magic, however. Clearwater Beach board members helped man the lines, and the food was great. How can you beat a fresh grilled burger on a beautiful evening by the sea? Short answer… you can’t. Members and guests set up tables to enjoy the food, wine, beer, and the beautiful surroundings. The universe granted us a beautiful afternoon and evening. Thank you, out there! Marian and Kenny relax and enjoy! We brought a large supply of cold rose, but wine and beer were available for a modest “donation” at the sun shed. Our larder included some carrot salad, pasta salad, smoked sausages, and some amazing raspberry cheese strudel from Junda’s bakery in Jamesport, NY. Don’t worry, we had our share of burgers, dogs, and sides too. Enjoy today, diet later! Our friend and neighbor, Judy Freeman, decided the party was a great time to ask for signatures for several petitions to be put to our town’s government. Judy is an architect by profession, a talented caterer, and lover of food and wine. Here she is, working the crowd to good effect. No worries, we kept a plate of food and cold glass of rose for her at our table. 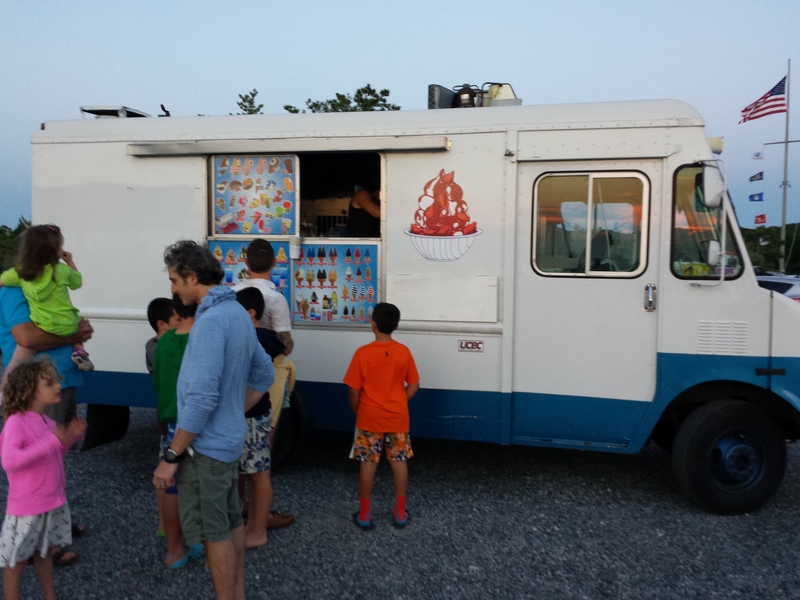 A favorite tradition at the BBQ is the all you can eat Ice Cream truck. Yes, everyone gets on the line, ready to collect the frozen treat of their choice. Despite the delish strudel, Marian, Kenny, and I waited our turn, and enjoyed the fellowship of our neighbors and their guests. The major topic of conversation was… “Say, this is a long line.” Perhaps a respite from the trouble and turbulence of the world. Isn’t it nice when the big problem on your plate is which ice cream treat to order? In the end, Marian and I ate a double chocolate double dip cone. Kenny had one all to himself. Way to go! I won’t tell you about the karaoke singing, the spirited dancing, and the many other small but memorable events at this get-together. As one guest likes to say, “what happens in Clearwater stays in Clearwater.” You will have to move here, or get yourself invited, to see what really goes on!